Working load T8 grade: 2t-80t；S6 grade:0.5t-55t. T8 grade is high quality structural alloy steel;S6 grade is structural alloy steel. The maximum testing load is 2times of the working load,the minimum breaking load is 4 times of working load. About the bearing capacity of 2t-80t,T8 grade is 40%-100% up higher than the S6 grade in the same dimension. 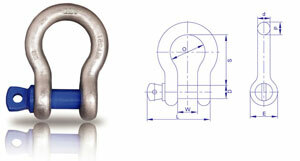 The products in accordance with the technical requirements and testing methods of ISO2415-2004.